RIO DE JANEIRO (AFP) - Perched atop a cherry picker truck several stories high, Brazilian graffiti artist Eduardo Kobra sprays puffs of paint on a sprawling mural in the colors of the Olympic rings. 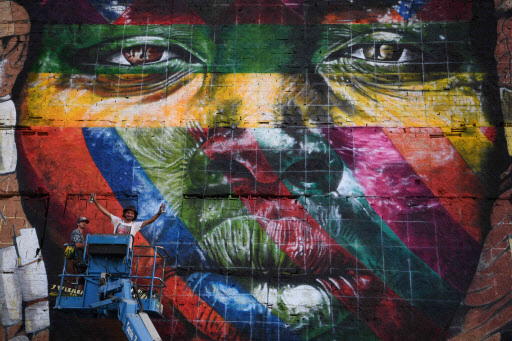 With three weeks to go to the Summer Games in Rio de Janeiro, Kobra and his assistants are racing to put the finishing touches on the 3,000-square-meter painting that graces a wall in the city's newly overhauled port district. They have already used 2,000 bottles of spray paint, 200 liters of acrylic and 100 cans of varnish, says Kobra, who grew up tagging walls in a hardscrabble neighborhood of Sao Paulo called Campo Lindo. From the age of 12 years old, “the street was my way to socialize, have fun and also protest against social exclusion,” he said. Today, he does graffiti “only with permission,” he said. His goal is to finish it several days before the August 5 opening ceremony -- in time for the thousands of tourists and athletes expected to descend on the city's iconic waterfront.